I got the idea for the French toast with Sooji (Rava) from Mahimaa's Blog. She is such a talented person who has passion for food photography. I've already tried her Chocolate Peda recipe. I have made few changes to her French toast recipe and came up with my own procedure. 1. Take yogurt, water, tomato, red chilly powder and salt in a mixer. Blend till smooth. 2. Add this to sooji along with onion and coriander. Mix well and keep it as such for 10 minutes. 3. Now, add 1 tsp of lemon juice. Mix well. 4. Heat a dosa pan. Add little oil. 5. Soak bread in the above mixture and place it on the pan. (you may have to place some mixture above the bread). Cook till that side turns brown on a medium heat. 6. Gently turn the bread to other side. Cook till brown. 7. Serve with a sauce. 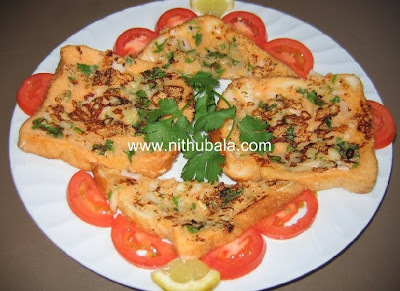 Beautiful rava bread toast, looks delicious..
Crispy and crunchy ones... nice idea..
i am also having one bread toast with rava in my blog ,u may look at it..
Super bread toast with rava, looks perfecto..
That looks wonderful Nithu, what a great idea !!! Your toast looks delicious and spicy. Thanks for trying the poha laddoo. Glad you liked it. Toast looks different and delicious.